BLOG TALK | ON SLOW BLOGGING AND SCHEDULES. I've gone through a lot of seasons when it comes to blogging. I have seasons when I'm all gung-ho about blogging, pumping out post after post to fill the month. And then there are the months where I only hear crickets in Blogger. Where I'll have an empty post draft open for a week (or two) and nothing will come to mind. I can't help but wonder what the best solution is for these seasons for blogging. Do I let them be? Because I know that if I push it, I'll regret forcing myself to blog when I don't want to. But I also know that I work best when I have motivation and encouragement. With changes a-coming this fall, I've been doing a lot of praying and thinking about what the future of my blog is. I want to say that I'll still have my 3 posts/week schedule, but I don't know if I'll be able to do it all and I don't want to pump out half-hearted posts just for the sake of a post or consistent schedule. But I don't want to completely quit, either. I've never been a true fan of becoming a blogger who pops in when she wants to. Not because there's anything wrong with that, but part of me oddly feels like I owe my readers and friends consistency. Either that, or I feel like I owe myself that consistency. I worry that if I slow down completely, I won't ever jump back in. And I definitely do not feel like stopping altogether is the solution. So I'm soaking up the concept of slow blogging and trying to define my blogging schedule while keeping myself active and engaged in the blogging world. What are your thoughts on slow blogging? What do you think is the best schedule for bloggers? Or do you believe in schedules at all? *raises hand* hi i'm a slow blogger :D. i don't think there is anything wrong with it. especially if it seems its been on your heart lately. i guess it depends what you are getting out of it. because its such a beautiful way to stay in touch with people and their lives - so it doesn't necessarily have to be how much YOU post as much as how you are engaging in other peoples lives....which is always the biggest benefit despite how wonderful a feeling it is seeing your space come to life with posts. Slow blogging is just fine! I love the idea of people KNOWING what to expect on what days...but sometimes, that's just not happening. Some of my favorite blogs are the ones where the posts are few and far between and each one is a complete surprise! I have a schedule in my mind for my own blogging, but these days, I pretty much don't stick to it! lol!!! How bout that time I apparently took a super long blog break. Ha. Didn't even plan on it... but with a move (did you know we moved?) and buying a house in a month or two, and getting a ministry off the ground... I''m not real sure it's going to be back any time soon. But it's really been ok! I've loved just reading other people's blogs! I have been struggling with this very topic. I don't know what I want to do yet. I thought I would be blogging a lot more this year but I guess God had a different plan for me. I hope that you come back but I love seeing everything on social media though. How's the puppy? The planner in me loves the idea of scheduling, but I have also found that scheduling usually means work I'm not as proud of. You know, I've always admired slow bloggers. There's something so freeing about blogging on YOUR time and preference, not blogging just to get a post out there. I think I see myself heading towards that direction. I've noticed that a lot of the bloggers who DO post on a schedule do so because it's more of a business to them and that's not where I see myself headed when it comes to blogging. Slow blogging is becoming more and more a part of me, I think! I completely agree with you. I crave routine and everything but it's just not where my heart is at when it comes to my blog. I hate having to feel like I need a post and I need to write--not because I WANT to but because I "NEED" to. Some of my favorite blogs are the ones who post here and there, too! I've always admired how they write so honestly and freely. And how genuine they are, too. Most of them aren't there for the money or the business, they're there to WRITE. And that's why I ultimately blog--well, that and the community, too of course!! But like you said, I think that there's something to be said about consistency and showing up so people can keep coming. It's not that I want the pageviews or stats, I just want people to know that I'm still around because I LOVE blogging. Both the community AND the writing aspects of it. I also think that a lot of bloggers DO push out lots of content tend to be more business/money-centered. Which isn't a bad thing, but I think that's why I feel like I need to push out more posts and follow their lead--even though that's not where I want to go right now! I love that you're also at a place where you're completely okay with not knowing if/when you'll get back to blogging. I'm a little envious of your freedom, actually! It's something that sounds like a really good change of pace for me (albeit foreign!) that I'm hoping I'll take advantage of this fall! I'm pretty much in the same boat. I go back and forth between wanting to post on a schedule because I like schedules AND because I feel like I owe it to my readers (aka friends) to post on a somewhat predictable schedule. But I also think there's something to be said about blogging on my schedule since it ultimately is my blog. But like you said, it's all in God's plans and this is something definitely worth praying over! She's good... she's not so much puppy anymore! and i think slow blogging is good. it's the schedule i've taken for the summer so i can enjoy things and not feel overwhelmed. <3 <3 <3 is you. Same! I love schedules and being predictable for my readers but it's also a little stressful and I'm finding that I want a break from having to do all of that right now, especially in the summertime. That, and like you said, my forced posts aren't anything I'm proud of, either! I guess I just worry that if I do relax, I won't come back--out of habit, you know? But I know it'll be good for me, so I think I'll just test the waters and see what happens. If a break is what you need, take it! i'm a firm believer in going silent for a little bit to get your head on right. i was JUST IN that season of blogging...where it seemed like too much. too much effort, thought, and not enough heart behind it. just take your time, LIVE LIFE, try some new things with your day to day life and gain some experience...and in time, that passion to write will refuel. right now i have a TON of draft posts because #1 i'm keeping with my 3 day a week while during the summer #2 when i'm feeling inspired, i write. either in a journal of ideas for posts, or if i'm able to open a draft i do it that way. I think a break IS what I need. I'm torn because I don't want to just fall off of the blogging bandwagon entirely, but at the moment, I'm just not feeling it and I don't want to push myself unnecessarily. So I'm definitely going to take your advice and just live life. I'll pop in every now and then and write when I feel like it, not because I have to. 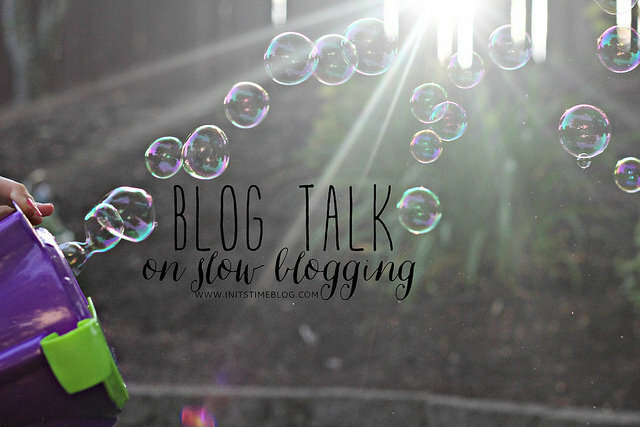 I'm glad you shared your heart with slow blogging! BUT I have learned that it is ok. People know I will post about once a week and they comment and appreciate the quality content. I think if I quit altogether the readers would leave and that would be sad because it's a community to me. I'm sure you will figure it out and I think your true readers will stay over time even if you take a week or two off here. I know you posted earlier and informed your readers of the week long break and I think that is really great to let them know you won't be around for a week. I also agree with you on quitting altogether--I couldn't do it either! The community is just way too amazing and even though I don't see myself being able to post all the time, I equally don't see myself quitting in the near future!